Earlier this month, Peter Murray of Kiyoi Communications, sat down with President and CEO of Permex Petroleum Corp. (CSE:OIL), Mehran Ehsan, to discuss the dynamics of the oil markets; how Permex has navigated growing in a challenging environment and where he sees Permex’s opportunities to continued growth. Peter Murray (PM) We’re going to discuss a range of topics, including the state of North American oil markets and how to make money in the current environment. But let’s begin by having you explain who Permex Petroleum is and the company’s strategy for making the most of opportunities in your industry. What makes Permex different? 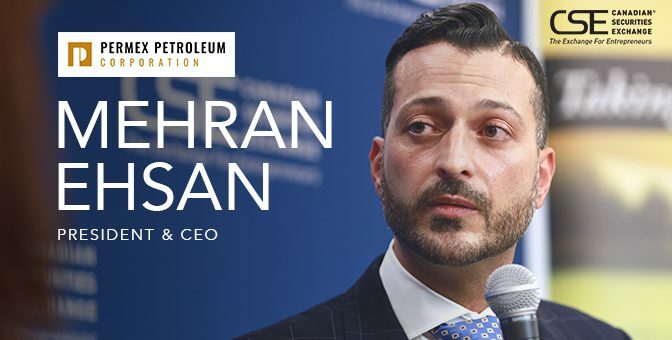 Mehran Ehsan (ME) Permex Petroleum is a uniquely positioned junior oil and gas company with assets and operations across the Permian Basin of West Texas, and the Delaware sub-basin of southeast New Mexico. We own and operate on state, federal and private land. The unique value proposition that Permex offers is a reflection of three main factors. Number one is the timing of our acquisitions. The company began acquiring assets in one of the worst cycles in history. During the downturn of the past three years Permex picked up a hawkish position by targeting companies with quite a bit of leverage. Typically, we were purchasing assets at 10 cents to 20 cents on the dollar. The second aspect that makes us unique is geography and geology. As for location, we are in the Permian, and the Permian is the most superior basin in the world. Most of the investment made by the oil industry during the downcycle was in the Permian, and Permex has been in the Permian since we began. From a geology standpoint, the best-producing formations in the Permian Basin are the Bone Springs, the Wolfcamps, and the San Andres. Having these formations within your reservoir is key to succeeding in this region. Permex has all three of these within its various properties. The final thing that makes Permex unique, and ahead of our competition in the junior space, is our structure. Every entrepreneur and CEO thinks they have a good structure, and they quite well might. With ours, we have 35 million shares outstanding, we have absolutely no debt, and I think we are truly undervalued given where we’re headed. (PM) How did you develop your insight and strategy for the company? Was it a single member of the team who had this vision, or was it more of a group decision? (ME) The board and executive team have over 240 years of combined experience in the oil and gas sector. Some of us have been through multiple cycles and we’ve seen big peaks and valleys. And with each valley we’ve witnessed devastation within the industry, but on the flipside is opportunity. However, these opportunities do not come every year. They only come every eight years or every 10 years. For Permex, the timing has been excellent to take advantage of market conditions. Everyone in the company sees it. (PM) Can you give us an example of a deal that you’ve done and how it reflects that approach of trying to take advantage of conditions within the industry? (ME) Let’s look at our most recent acquisition. We took an approximately 48% working interest in the ODC and Taylor unit in Gaines County, West Texas. The other main partner on the field is Occidental Petroleum. What we ended up paying for this asset was about US$1.9 million. The field is already in production. To illustrate the value we were able to add, you essentially divide the price paid for the total field by the amount of production you get, and this yields a number called “per flowing barrel.” We ended up paying $11,000 to $15,000 per flowing barrel. To put that in context, the market right now is around $45,000. Currently in our area, you see acreage going anywhere from $500 to as high as $10,000 per acre, yet we paid $500 to $700 per acre. That is another testament to us entering the market during a downcycle and buying it at a discount. (PM) That seems an obvious strategy – buy low and sell high. Why don’t lots of other entities do what Permex does? (ME) Actually, I think quite a few companies do use a similar approach. You don’t have to look far for a good example. Ring Energy started in 2002 and has just grown and grown. In the last downturn it expanded substantially by taking advantage of the cycle. The main reason we don’t see this happening all the time is that it is not simply a matter of buying low and selling high – there is more to it. You can buy low in the wrong environment and the wrong location and it doesn’t matter if the market comes back up because you won’t benefit from it. To give you an example, in the Canadian environment right now there is too much regulation, too much red tape, and taxes are too high. (PM) Can you give us some insight into the different regional oil markets in North America? What would be your Top 3 jurisdictions and are there some areas or types of plays you would avoid? (ME) First of all, we don’t do anything offshore. Looking at opportunities onshore, we are quite biased toward the Permian Basin, and I’ll give you valid reasons why we think that way. Out of 22 billion barrels of proven reserves in the United States, 9.8 billion belong to the Permian Basin, or over 44%. Looking at US production, 3.2 million barrels a day is produced in the Permian, compared to 10 million to 11 million in the entire US. That means that around 30% of production in the United States comes from the Permian, which is just a portion of West Texas. Looking at the number of rigs now actively drilling, which indicates where investment is going, in the Permian it’s 471 rigs, which represents over 42% of rigs in the US, and over 22% of global rigs. That is why the Permian is our top choice. This is the gem of the United States, if not North America. There is nothing comparable to it. In fact, the Ghawar Field in Saudi Arabia would be the first comparison that comes to mind, and some believe this is a better field even than that. The next one we would look at is the Scoop/Stack play of Oklahoma. There has been some development there, some horizontal drilling within those formations and basins and they are quite lucrative. And lastly, we would consider the Bakken. The Bakken has become more efficient, although the grade of oil is a little different. It is not as high a grade, so refining can be an issue at times. That would be an area we would review. Unfortunately, there is no Canadian play in our Top 3, and the reason is geopolitics, red tape, and not enough infrastructure to take your product to market. As a result, junior companies cannot compete with juniors operating in the Permian. The only ones in Canada that will continue to be successful are mid-caps and large-caps which monopolize this market and take advantage of what the government puts out there to block juniors. Canada has abundant reserves in the ground and we would love to tap into them to benefit the Canadian economy as well as Permex and our shareholders. But until some of the governmental agencies change and we begin to see some federal and provincial agreements, we won’t be willing to move into the domestic market. As a junior we just cannot get involved, unfortunately, because at the end of the day it is the bottom line that matters for shareholders. (PM) What is the medium- to long-term outlook for Permex? And how large can the company ultimately become? (ME) Our focus right now is on developing our fields. Scaling up production, in other words. The second goal will be continuing to build reserves by adding landholdings and leaseholds. In the medium term, we believe the company can reach a market capitalization far higher than where we currently stand with an appropriate injection of capital into various sectors within our development plays. The long-term goal is for Permex to rank among midsize producers, or perhaps even alongside the big boys. There are many companies that six or seven years ago started on the same path and followed the same formation, and they are now reaching that $800-900 million market cap. Ultimately, either a large-cap takes us out, or we become one ourselves. (PM) You mentioned earlier the depth of experience on the Permex team. Are there any new lessons you have learned since Permex was established? (ME) One of the main things I would point out is what we think is the Achilles heel for many oil companies, which is not having the ability to be flexible during a downcycle. Many companies fail not because their operations are bad or they are too leveraged, but because they cannot quickly adapt to a lower-price environment. Being fluid and flexible is the key to surviving in this industry. In our opinion, you need to have a lean company and a low burn rate to be able to weather some of these storms, and if you don’t then there are real issues. (PM) Do you have any advice for entrepreneurs who are looking at the oil market – or any type of business for that matter – and trying to determine the best way to move forward on an opportunity that they have perceived? (ME) I consider myself a contrarian, so I do not have a herd mentality whatsoever and I believe that if an entrepreneur wants to get into any sector they have to have a unique value proposition and showcase why their project and their company is ahead of the curve. This is particularly true in the oil industry, as our deliverables are much closer at hand than in many other businesses. Oil companies really need to be on top of their game in terms of defining and demonstrating a unique value proposition.